Optimizing, testing and comparing performance of massive MIMO base station algorithms and RF hardware settings require a RF channel emulator that is capable of emulating in real-time the massive MxK RF channels, where M≥64 is the number of RF paths in the base station and K≥8 is the number of spatially multiplexed UE data streams in the same resource block. This is needed in multiple stages, from development, production to deployment. Several operators (e.g., China Mobile, Softbank) have deployed 64Tx/64Rx TDD 3D MIMO base stations and have obtained 2x to 4x throughput and coverage gains. They are expanding to large scale deployment and most operators are expected to start deployment of such system soon. However, to date, there is no RF channel emulator available that is capable of testing such 3D MIMO base stations for 64×8 and 64×16 MIMO. 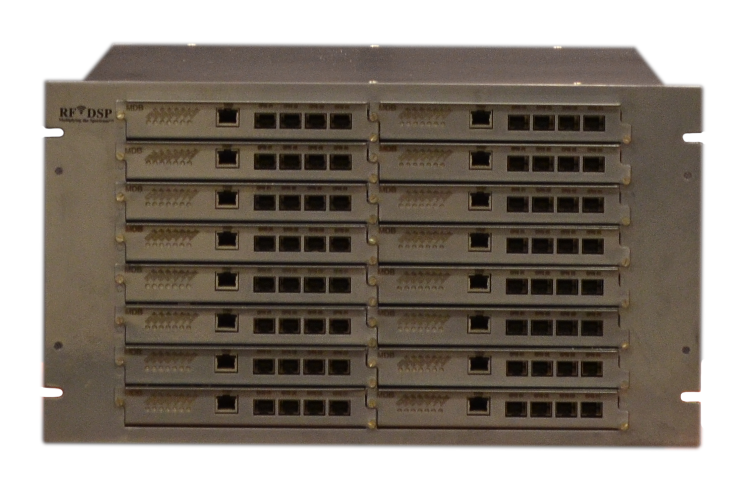 A massive MIMO RF Channel Emulator will help equipment vendors speed up the development and optimization of new massive MIMO base station products, and help operators evaluate the performance of massive MIMO base stations from different vendors using realistic channel models capturing their deployment conditions and make wise deployment decisions. In a TDD system, a massive MIMO RF channel emulator must maintain the reciprocity of the over the air channel (OTA) so that the BS can estimate the DL OTA channel using UL signaling. This allows the channel estimation in a massive MIMO system to scale with K rather than M, thus significantly reduces the overhead of channel estimation in a massive MIMO system. The Avalo MCE is a RF MIMO Channel Emulator (MCE) for Massive MIMO applications, with either RF or CPRI interface for BS and UE antenna signals. The MCE comprises a baseband channel emulator MCE-BB128A, a Base Station (BS) side RF unit MCE-RBS64A and a User Equipment (UE) side RF unit MCE-RUE32A. 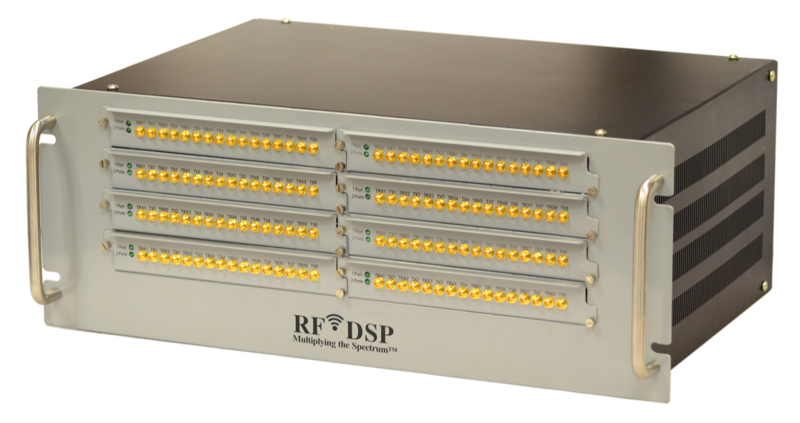 The RF interface between a BS under test and the MCE-RBS64A can be over-the-air using RF DSP’s proprietary Avalo Air Array or via RF cabled connections, supporting a M-antenna base station (BS) and K antennas on user equipment (UE) devices with hardware configurations of MxK, where M≤128 and K≤32. For the first-generation MCE, M=64 and K=8. Next generation will support higher M and K values. The MCE-BB128A can also be used alone for baseband only channel emulation by interfacing to the BBU of a BS directly using CPRI, which may require a protocol translation module for proprietary CPRI implementations. The RF transceivers use Analog Devices’ highly integrated RadioVerse chips to deliver superior performance with low power consumption and compact size, in contrast to the conventional bulky, heavy and extremely expensive RF channel emulators in the marketplace that so far can only support 64×4 or lower order MIMO. Similarly, the interface between the MCE and the UEs under test are either CPRI or RF via coax cable connections. Both the BS-side and the UE-side RF connections offer an option for either single port IN and OUT or separate IN and OUT ports. The digital baseband channel emulator MCE-BB128A at the core of the system supports repeatable emulation of real-world multipath fading, interference and noise conditions. Any customer or 3rd party defined mathematical model for fading generation can be supported. There are a large number of RF paths. It is a hassle to disassemble the RU, remove the antenna array panel, and make 128 or more RF port connections using cables for a conducted test. Moreover, antennas in a massive MIMO system may be integrated with the RF circuits and there are no antenna ports for using cables to connect the BS RF paths to the channel emulator. 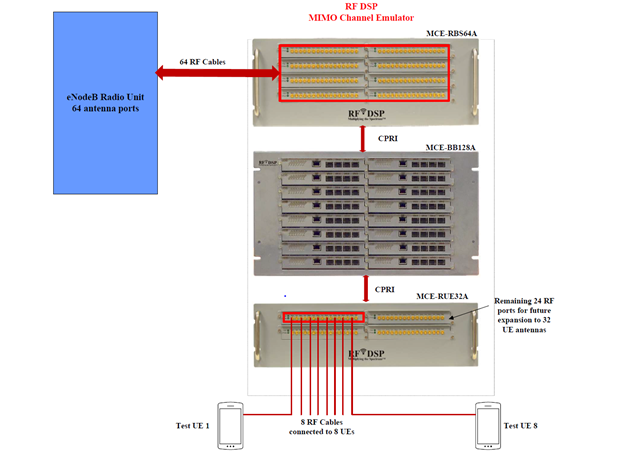 There are no prior art RF channel emulator that can enable OTA testing of massive MIMO eNodeB. The great challenges of OTA testing is in maintaining all the degrees of freedom of the 64×8 or 64×16 RF channels, i.e., achieving full rank massive MIMO channel matrix, using a man-made test setup that fits in a reasonable space and with a reasonable cost. It is extremely difficult, even if possible, to generate a full rank RF channel matrix in a RF chamber. Existing OTA test setups using RF probes add an unknown channel matrix whose matrix rank is much smaller than that in a real deployment scenario. We have invented and tested a solution that enables OTA testing of massive MIMO RF channel emulators that maintains the full rank of the massive MIMO base station. This solution will revolutionize the optimization, testing and development of massive MIMO systems.